This remarkable book is difficult to classify exactly. Ostensibly it is a study of the exploration of the polar regions, the history of which is rich enough in drama, suffering and pathos to fill a hundred books. But to describe it as just that would not convey its quality. As Francis Spufford remarks, when people read of those fearful expeditions to the North or South Pole or in search of the Northwest Passage — terrible tests of endurance that were often fatal — the natural question to ask is, why? What impelled people to pay such a price for such intangible prizes? In seeking the answer Spufford ranges across social history, literature, economics and mythology; the result is a kind of ‘secondary’ history of a strange aspect of our national past, an imaginative account, which glows with knowledge and understanding. As the man in Tristram Shandy said, there is a Northwest Passage to the intellectual world; and Spufford, by choosing to view history from this oblique, unusual angle, has been far more successful than most of the terrestrial explorers of whom he writes. The idea that the deaths of brave men were justified by such a patriotic demonstration took root in the popular mind, along with the affecting narrative contained in Scott’s diary; even today few people are unfamiliar with that story, and its record of the self-sacrifice of Captain Oates which has given this book its title. It is true that there often have been dissenting voices. One sardonic view of the business found early expression in a satirical print by Cruikshank entitled Landing the Treasures, or Results of the Polar Expedition!!! This shows the triumphal march up Whitehall of a naval party who have all lost their noses through frostbite. The leading officer wears a paper nose, for dignity. The ‘treasures’ include such items as ‘Worms found in the intestines of a Seal’ and a walking stick ‘North Pole’. The whole affair is lampooned as a futile venture, only to be applauded by the ignorant mob. 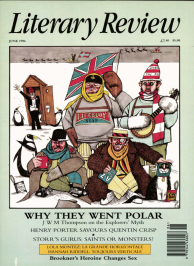 More recent critical comments have fixed upon the technical shortcomings of many of the explorers, as well as noting what Spufford calls the ‘bizarre gratuitousness’ of polar exploration. The reaction to such dismissive writings is more complicated than the simple patriotic fervour which the various expeditions originally aroused: ‘The news that Scott, like Franklin before him, probably died of incompetence does not affect an attraction to his story which centres on his bearing in the face of death. Maybe it even strengthens the attraction in some ways.’That, of course, is true, but it does not disguise the really rather astonishing degree of ‘incompetence’ which exists within these epic tales of courage. Why that should have been so is an essential part of Spufford’s study, involving such considerations as imperial assumptions of superiority, nostalgia, disdain for lesser breeds, and so on. Sir John Franklin and his party perished in a hopeless quest for the Northwest Passage, freezing or starving to death before they had gone very far, and yet the territory they were crossing supported a native population who knew perfectly well how to survive there. Because the Eskimos were not thought by superior Europeans to be worth consulting, a hundred or so men were lost. In much the same way the Scott expedition took little account of Eskimo experience. Amundsen, on the other hand, did not share these assumptions; trained by Eskimos and equipped with their dog teams, he glided smoothly to the South Pole, leaving there a Norwegian flag to greet the struggling British party, hauling their own sledges, when they finally arrived. Spufford supplies a gruesome detail to illustrate the cultural gulf that isolated the explorers from more knowledgeable peoples. In 1897 Peary took a party of Eskimos back to the United States, where they soon sickened and died, victims of bacteria which did not exist in their antiseptic homeland. ‘The flesh was rendered off their bodies, and their skeletons, articulated with wire, were displayed in the Museum of Natural History, as further examples of Arctic fauna among the walrus tusks and the stuffed seals.’ The creation of national heroes was not, evidently, to be achieved by dealing with such lesser beings. Altogether this is a fine book. Spufford writes very well indeed, and shows himself to be as much at home in dealing with complex ideas as in deploying historical evidence or producing imaginative reconstructions of past events. His closing section, in which he imagines the last harrowing days of the Scott expedition, is brilliantly carried off. And since he is not labouring any political theories or pushing his own prejudices, his book represents a satisfying and original account of a large slice of our national past.